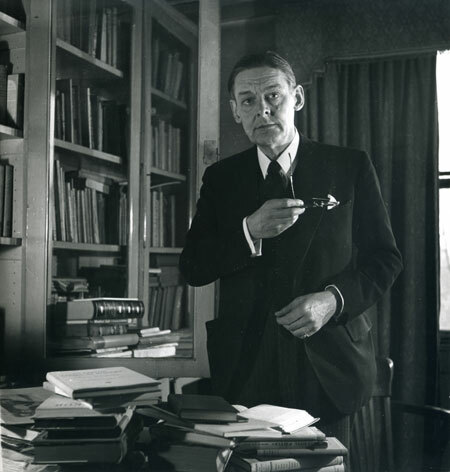 Thomas Stearns Eliot OM was an American-born poet, playwright, and literary critic, arguably the most important English-language poet of the 20th century. The poem that made his name, The Love Song of J. Alfred Prufrock�started in 1910 and published in Chicago in 1915�is regarded as a masterpiece of the modernist movement, and was followed by some of the best-known poems in the English language, including Gerontion (1920), The Waste Land (1922), The Hollow Men (1925), Ash Wednesday (1930), and Four Quartets (1945). He is also known for his seven plays, particularly Murder in the Cathedral (1935). He was awarded the Nobel Prize in Literature in 1948. Born in St. Louis, Missouri, and educated at Harvard, Eliot studied philosophy at the Sorbonne for a year, then won a scholarship to Oxford in 1914, becoming a British citizen when he was 39. "My poetry has obviously more in common with my distinguished contemporaries in America than with anything written in my generation in England," he said of his nationality and its role in his work. "It wouldn't be what it is, and I imagine it wouldn't be so good ... if I'd been born in England, and it wouldn't be what it is if I'd stayed in America. It's a combination of things. But in its sources, in its emotional springs, it comes from America."